Microorganisms exist primarily as communities in nature. A variety of interspecies interactions exist which may be beneficial, detrimental or lacking effect. Understanding what drives community structure and how these communities evolve with changing environmental conditions will help us to understand the roles these organisms have within their environment and community. Using this information, and potentially the use of synthetic ecological systems, we can begin to address more specific issues such as bioremediation and biofuel production. 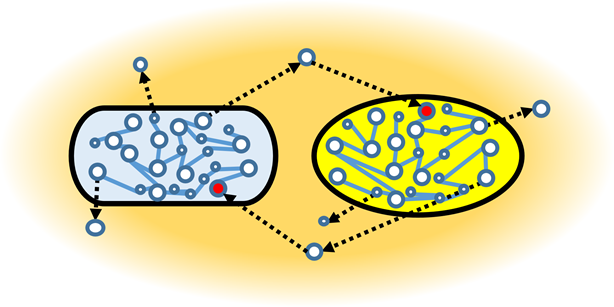 In the Northen lab, we use a number of different techniques to help us understand these interactions and to build and study synthetic communities. Mass spectrometry analysis of the small molecules that are uptaken and released by individual species can help us predict whether different species will interact in a cooperative, competitive, antagonistic or unidirectional manner within a specified environment. 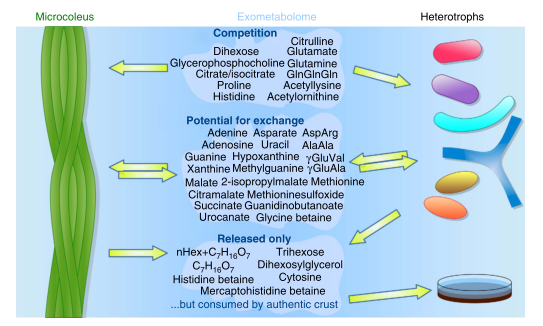 One way to determine how metabolites are exchanged between organisms is to use the cell extract or extracellular metabolites from one species for the culture of another species. For example, in Baran et al., 2015, we used sterilized cell extracts from Microcoleus as a culture medium for heterotrophic bacteria isolated from biocrust in Moab, UT.1 LCMS analysis of the extract before and after culture of the heterotrophs provides us a way to determine which metabolites may be actively exchanged when they are growing together in a community. We also employ a method called acoustic printing, in which an ultrasonic sound wave is used to print droplets of bacterial solutions onto a solid culture medium. 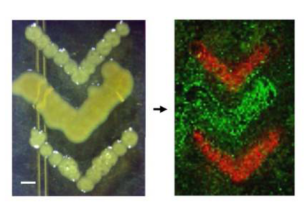 Using this method, we can print different species of bacteria next to each other. Because it can be difficult to see what is happening between species on the microscopic level in a natural environment or in liquid medium, this provides us a way to assess visible morphological changes in adjacent species of bacteria. Sometimes, one species will produce an inhibitor or toxic compound resulting in smaller colony size. Similarly, one species may produce a desirable compound which enhances the growth of nearby colonies of another species. The visible morphological changes observed with printed bacterial colonies gives us very limited information as to what is happening at the molecular level. Using another technique called “replica-extraction-transfer” described in Louie, et al., 2013, the metabolites from the printed bacterial colonies are extracted and transferred to a surface for MALDI based mass spectrometry analysis.2 This provides us with information on the spatial distribution of released metabolites. We are then better able to determine which molecules might be involved in or responsible for the observed morphological changes.